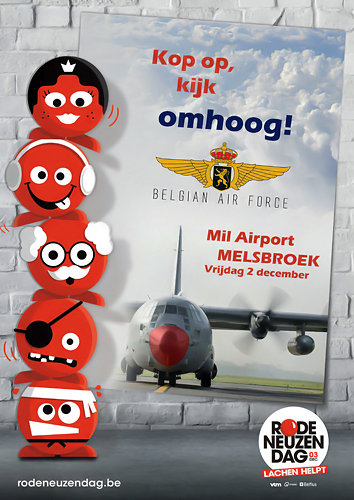 With the approval of the ACC, CHOD and MOD COMOPSAIR-IPR organized a project to support the Red Noses Day action. What is this Red Noses Day? One out of five Flemish youngsters struggles with psychological problems often with serious consequences. That is why VTM (TV broadcast), Q-Music (Radio broadcast) and Belfius (Banking Company) have, for the second time, organized the Red Noses Day on Saturday December 03rd, 2016. All of Flanders participated in this fundraising for a better day care for these youngsters. Tens of thousands youngsters are still not getting the appropriated care they need. It is about time to change this situation. What is the connection with Defense? There are also colleagues within this department struggling with psychological problems. Moreover, there is study-group and directive regarding psychological problems and assistance. The Military Hospital Queen Elisabeth, with her Centre for Mental Healthcare, can rely on a whole team of specialists (psychologists and psychiatrists) to assist and advice them. Psychological problems do not always have to be the result of harassment! Important or serious occurrences, too much stress or a burn-out also can lead up to those problems. Furthermore, most of them are parents and all they want is to have a healthy and safe future for their children and grandchildren! The Air Component does where she excelled in, flying! 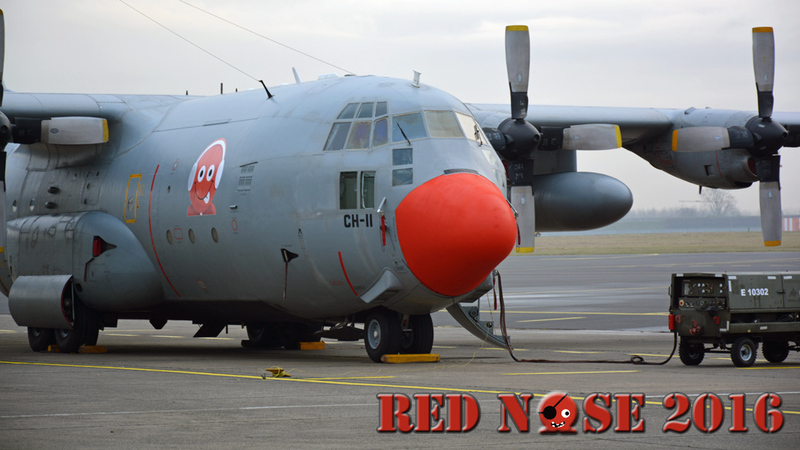 A C-130 transport aircraft of the 15 W will be adorned with a red nose and two little Red Noses figures on the fuselage. Besides this, 25 youngsters with psychological problems will be offered a flight aboard a C-130 to forget a little their worries! The results of the whole action, including the project of COMOPSAIR-IPR raised a stunning of 4.103.477 euro! Thanks to all of you who made this Red Noses Day a success!